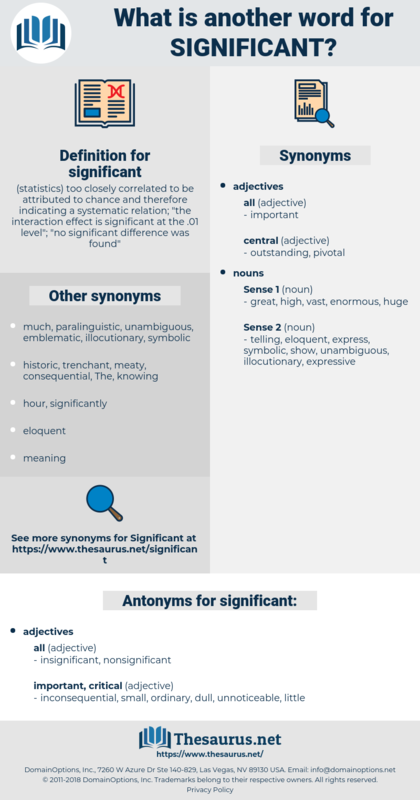 What is another word for significant? ( statistics) too closely correlated to be attributed to chance and therefore indicating a systematic relation; " the interaction effect is significant at the . 01 level"; " no significant difference was found"
appreciable, important, momentous, meaningful, notable, remarkable. enormous, massive, far-reaching, immense, drastic, outstanding, large-scale, profound, weighty, perceptible, interesting, influential, discernible, negligible, striking, non-negligible, nonsignificant, obvious, inconsiderable, great, pivotal, apparent, overwhelming, wide-ranging, deep, high-profile, hefty, intense, excellent, all-important, monumental, eloquent, telling, eminent, consistent, worthwhile, characteristic, pronounced, widespread, pre-eminent, sufficient, evident, revealing, real, sized, symptomatic, determinant, indicative, potent, dominant, steep, seminal, definite, key, discernable, consequential, spectacular, preponderant, commendable, importance, increased, positive, illustrative, giant, genuine, numerous, paramount, extraordinary, transcendent, ample, compelling, phenomenal, staggering, respectable, integral, observable, gigantic, worthy, crucial, radical, big, intensive, typical, notorious, generous, sweeping, robust, critical, solid, vigorous, serious, net, transcendental, instrumental, meaningless, colossal, relevant, wholesale, actual, instructive, active, long, manifest, effective, necessary, precious, urgent, consequent, measurable, special, blatant, in-depth, wonderful, exceptional, palpable, extreme, voluminous, flagrant, difficult, fat, lengthy, small, stark, resounding, valid, excessive, exciting, true. Criteria, highlights, notices, beings, Stories, Les, elders, great, key, importance, crucial, big, critical, serious, relevant, vital. highlights, Les, lot, key, importance, relevant, measurable. 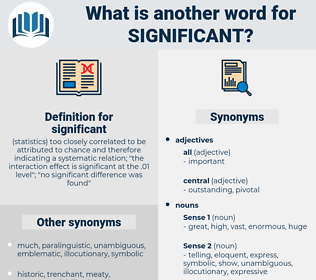 sizable, tremendous, fundamental, substantial, major, noteworthy, daunting, vast, abundant, distinctive, distinguished, useful, landmark, large, strenuous, vital. substantial, major, noteworthy, vast, landmark, strenuous. inconsequential, small, ordinary, dull, unnoticeable, little. nonmeaningful, anonymous, bitty, puny, diminutive, worthless, marginal, ineffective, infirm, feeble, miniature, meager, insubstantial, unexpressive, pocket, smallish, incompetent, incapable, unskillful, inept, Picayunish, unqualified, undersized, unskilled, tiny, unfit, pocket-size, pint-size, inexpert. Suddenly, at the opening of the last drawer, a significant " Ah!" Whatever may have been their private fears or feelings, all however seemed smiling and significant, as if they knew something if they chose to tell it, and that something very much to their own satisfaction.